One person was killed and 108 injured when a crowded rush-hour commuter train crashed through a barrier at a busy station in New Jersey and lurched across the waiting area. The train driver - who has not been named - was injured and taken to hospital, but was later released. They said he was cooperating with investigators. US National Transportation Safety Board vice chairman Bella Dinh-Zarr has told reporters that an investigation into Thursday's train crash "will continue here on scene for seven to 10 days". She said the train was operating in a "push-pull configuration", in which the locomotive can be driven at either end, and confirmed retrieval experts will remove the event recorder - which tracks speed, braking and other data - from the rear of the train on Thursday night. Officials had earlier confirmed the train driver was injured and taken to hospital, but was later released. They did not provide details of his injuries, but said he was cooperating with investigators. The one person who died at Hoboken train station after a train carrying hundreds of passengers crashed into it, causing the ceiling to fall, has been named by authorities. Fabiola Bittar de Kroon, 34, was standing on the platform when she was hit by debris caused by the crash. Just over 100 people are believed to have been injured in the accident, which authorities are investigating. Donald Trump has tweeted saying he gives his "deepest gratitude" to the first responders and emergency crew who dealt with the Hoboken train crash in New Jersey. He also offered his condolences to those people involved in the accident. My condolences to those involved in today's horrible accident in NJ and my deepest gratitude to all of the amazing first responders. Governor of New Jersey, Chris Christie, and governor of New York, Andrew Cuomo have discussed the train crash in Hoboken that left one woman dead and over a hundred injured. They reiterated that so far there was just one fatality, and 108 people injured, with the injured in varying conditions from those who could walk in to hospitals, to those who had to be taken in by ambulance. They said that the one fatality was due to debris from the station, and not from the impact of the crash, underlining the importance of assessing and repairing structural damage to the station. Drawn on why the accident happened, Governor Christie rejected press speculation and said: "We don't know why it happened. The one thing we know is that the train came in at much too high a speed." The two governors said that an investigation was underway to attempt to find out what happened. Governor Cuomo said: "If there's something to learn then we will be sure to learn it and incorporate that lesson." While some services like the PATH train service could be resumed by rush hour, they said, they could not say when all services would be fully resumed, only saying that the station would be opened once it was safe. Hillary Clinton, the presidential candidate for the Democrats, has tweeted about the accident saying the photos coming from the train crash are "horrifying". She also offered her prayers with people who were injured or lost loved ones in the accident. 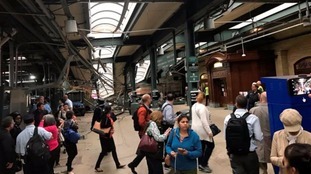 Several short videos taken by someone in Hoboken train station shows the impact of the train crash on the terminal structure and on passengers in the vicinity. The ceiling of the terminal can clearly be seen collapsed onto the train and the platform ground in the footage. The videos also show emergency services responding, and stunned victims being treated outside the station in the immediate aftermath of the accident. 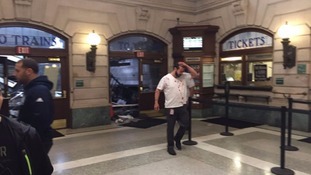 An emergency phone call made from Hoboken station describes "major casualties" and "people trapped on the train", following the crash. The caller also describes "heavy structural damage" and calls for support at the station. A businessman has described how a commuter train going "way too fast" crashed into the station at Hoboken, New Jersey. David Potter, 29, was in the station when the train "jumped the track", adding: "The ceiling looked like it was caved in with wires hanging, and people were running. "An officer led us to the street where they began closing everything off. Ambulances [and] police officers were covering the scene and people were laying down outside hurt." Mr Potter regularly uses the station for his work commute, said that he saw an "older gentleman" who was "bloody on his face" being sat down and talked to by ambulance personnel and an officer. At least one person has died after a train crashed into a Hoboken station, New Jersey Governor Chris Christie has said. Earlier reports said that three people had died, but that number has since been revised. Three people are being treated for serious injuries following the Hoboken train crash. A spokesperson for Jersey Medical Centre, where those injured in the crash have been taken, said those in a serious condition were being treated by trauma surgeons for orthopaedic and internal injuries, and "deep lacerations". The spokesperson added that around 10 other patients were being treated in the emergency room, while 40 walk-in patients were being evaluated. They continued that the situation in the hospital was "all hands-on-deck" and that they were not expecting any more patients. A train has crashed through a station in New Jersey and many passengers are feared injured.